If you can't see images, you may have to change your email settings. Thank you for your prayers for the Cairo International Bookfair. In spite of all the turbulence in Egypt these days, the Bookfair opened on time and has been doing well. Attendance is lower than expected but the Bookfair grounds have been peaceful, providing more time for quality interaction with those who are sincerely seeking. It�s been 3 years since the January 25th revolution. The subsequent Islamist victories in both parliamentary and presidential elections came as no surprise. Egyptians are very religious by nature, and the masses were seen as being easily manipulated by religious slogans and intimidated by any show of force. Many feared that � once the Muslim Brotherhood (MB) was in power - Egypt would be saddled with this new �theocracy� for decades to come. What was very surprising to all of us was how quickly the Islamist agenda was discredited; the majority of Egyptians had turned against the MB by last summer! It was also amazing that - in spite of threats of violence by the deposed MB - over 20 million people voted in the recent referendum on a Constitution which upholds human rights. Also, on the 25th of January millions took to the streets in support of the direction of Egypt�s present government. 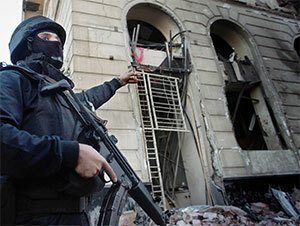 Regrettably, however, many acts of violence took place all over Egypt that weekend. The Egyptian masses are no longer to be underestimated! The gr eat amount of violence attributed to the MB since their removal from power has made many Egyptians hate them. Because the West has not sufficiently condemned the Islamists for their violence, focussing instead on police brutality in resisting them, many Egyptians blame the West for indirectly supporting these acts of terror! As we move into 2014, the tide has been reversed: instead of an Islamist majority imposing its will on moderate Muslims and Christians, we have a government which is determined that the MB has no control over the media or politics! This has made it extremely difficult for those who - although they have no sympathy for the Islamists - believe that true democracy should allow them to freely express their views. This position is held by many intellectuals, youth and virtually all Western media. Yet both past and recent experiences with the MB are the grounds for the government�s strong-handed repression. So where do we stand as Christians? Frankly, we are delighted to have the MB out of leadership and grateful for a new degree of inclusiveness and respect towards the Church. In my lifetime I have never seen such openness to Christians in Egypt. On the other hand, while we see no viable alternative solution to restrain the Islamists� violence, we do not want to align ourselves uncritically with hatred or discrimination towards any human beings. Thank God for church leaders who continue to call for an attitude of love and forgiveness towards all. 1. For wisdom and restraint for our government and for all Egyptians, whatever their political perspectives. 2. For continuing safety at the Bookfair until its end on February 6th. 3. That the many Scriptures which we and other Christian publishers are selling may reach those who really want to get closer to God during these challenging times. PS: Please feel free to share this with your friends. Copyright � Bible Society of Egypt, 2014 All rights reserved.